Upgrades and efficiency measures at the renovated Blackstone steam plant (pictured) have helped to reduce Harvard's greenhouse gas emissions. The University's Sustainability Report, available only online, aggregates University-wide sustainability data from Fiscal Year 2006 through Fiscal 2014. Inside the brick walls of an electricity plant built along the banks of the Charles River more than a century ago, Harvard is demonstrating just one example of its broad, on-campus approach to confronting one of this century’s greatest challenges: climate change. According to the University’s Sustainability Report, released online today, fuel switching at the renovated Blackstone steam plant — combined with upgrades to outdated equipment, efficiencies at chilled-water facilities, and reductions in energy use in buildings through energy conservation and behavior changes ― have already contributed to 60 percent of Harvard’s progress in meeting its goal to reduce greenhouse-gas emissions 30 percent by 2016 (this includes growth). The other 40 percent is attributed to the regional electricity grid’s transition to cleaner energy sources. Overall, University-wide greenhouse gas emissions were reduced 21 percent from Fiscal Year 2006 through Fiscal Year 2014, even when accounting for more than 3 million square feet of growth and renovation (excluding that growth, emissions were reduced by 32 percent). That’s equal to 58,013 metric tons of carbon dioxide since 2006, the equivalent of taking 12,213 cars off the road. An expanded combined heat and power system being implemented at the Blackstone plant later this year will more efficiently produce electricity and steam for University buildings, providing 28 percent of the electricity consumed by the Cambridge and Allston campuses, while further reducing the plant’s carbon footprint. From green buildings and sustainable transportation, to human health and wellness, the Sustainability Report details how Harvard’s deep commitment to sustainability extends well beyond the issue of climate change. 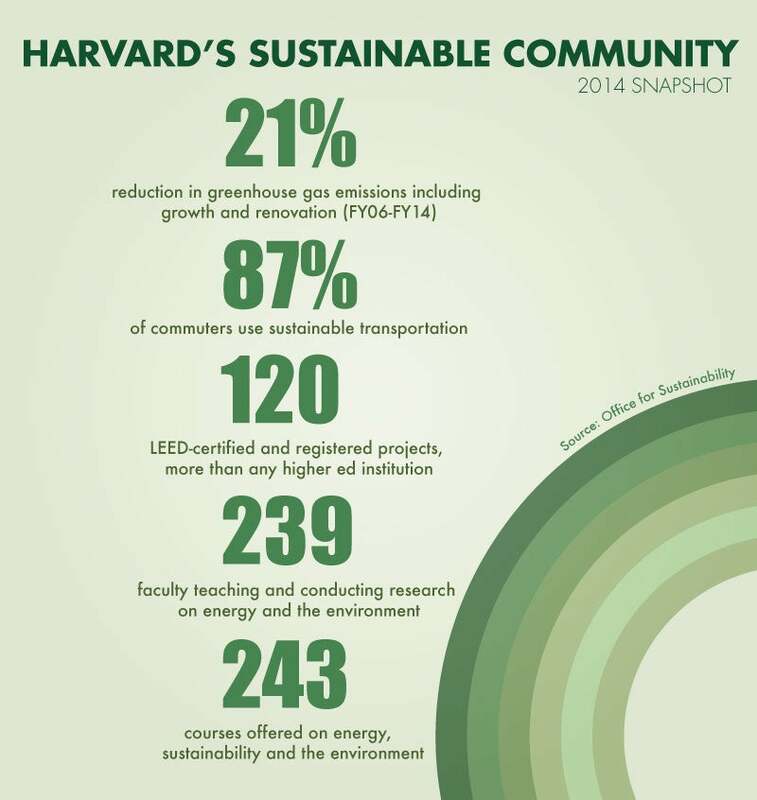 The report was created by the Office for Sustainability (OFS) to update the community on the University’s progress in meeting the goals and priorities laid out in the Harvard Sustainability Plan released in 2014. The report, available only online, aggregates University-wide sustainability data from Fiscal Year 2006 through Fiscal 2014. Since 2006, the University has reduced water usage by 21 percent, the equivalent of filling Blodgett Pool 196 times. The amount of waste produced per capita has dropped 27 percent. In 2014, students led the implementation of composting in all freshman dorms, and more than 413 tons of materials were collected for donation or reuse. Significant milestones include an update to the University’s Green Building Standards that incorporated the latest in sustainable and high-performance building techniques, and recognition by the League of American Cyclists as a gold-level bicycle-friendly university. Eighty-seven percent of Cambridge/Allston commuters and 85 percent of Longwood commuters use Harvard-subsidized sustainable transportation options to get to work. Working groups have been convened, representing stakeholders from across the University’s Schools and departments, to hammer out new standards and policies for Green IT and climate preparedness. And, through a partnership with Harvard Strategic Procurement, OFS is laying the groundwork for future sustainable purchasing standards. Harvard’s sustainability efforts are also challenging students to conceptualize creative solutions to real-world challenges on campus. A micro-grant program provides seed funding to student-led sustainability projects that are developing Wi-Fi-connected tools to remotely monitor and control energy in laboratories, designing a super-efficient electric car as part of a national competition, and connecting climate change with art. At the Harvard Business School, three student sustainability associates are working to increase the number of sustainability case studies on campus. Harvard’s holistic vision for sustainability also incorporates a thorough consideration of the health and well-being of the community. As part of an effort to better define what the issue means for the University, OFS is collaborating with scientists at the Harvard T.H. Chan School of Public Health and the nonprofit Silent Spring Institute to better understand building materials on campus, and to identify and track significant chemicals of concern. The Harvard Food Better initiative, launched in 2014, is engaging hundreds from the community in discussions about how to build a healthier, more sustainable, nutritious, and equitable food system. More than 500 central administration staff have participated in the Mindfulness at Work pilot wellness initiative launched by the Center for Wellness and Office of Work/Life with Lapp’s support. Ninety-six percent of the participants reported that the courses help them be more effective employees. The air is getting cleaner too: eight Schools, plus Harvard Yard, North Yard, and the entire Harvard University Housing portfolio are now smoke- or tobacco-free. Harvard University's Memorial Church steeple is lit with teal lights in recognition of Sexual Assault Awareness Month on campus.